Automate the configuration, deployment and ongoing management of applications in the cloud. Platform-as-a-Service (PaaS) allows IT departments to focus efforts on their custom applications, not the platform they run on. With the Windows Azure platform, your IT team can develop custom solutions and manage design, development and deployment, without the need to purchase and manage the server hardware, software, storage, security, or networks that used to be required to deliver the solution. Our clients have benefited from this service model. If you would like to explore possibilities for your organization, contact us to schedule a complimentary consultation. Quickly deploy and manage powerful applications and services with Windows Azure Cloud Services. Simply upload your application and Windows Azure handles the deployment details - from provisioning and load balancing to health monitoring for continuous availability. Your application is backed by an industry leading 99.95% monthly SLA. Never worry about patching, hardware failures, or network issues again. Windows Azure Cloud Services is designed to let you build applications that are continuously available even during system upgrades and hardware failures. Now you can just work on the code - the part that matters. Windows Azure PaaS delivers a robust platform, allowing developers to build, test and deploy applications with ease, letting enterprises focus on the application and innovation, rather than managing complex computing resources. Every new mobile application needs a powerful set of server side services to power it. 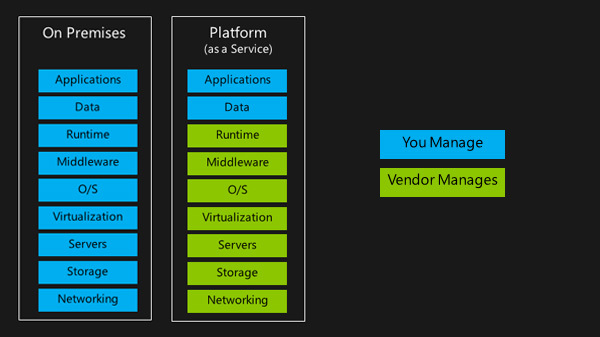 With Windows Azure Cloud Services you have everything you need to build the most robust, scalable APIs you can dream up. Take advantage of instant access to infinite scale so you can handle huge success without having to write any new code. Windows Azure Cloud Services provides the most effective application environment for building the most modern, distributed, computing applications on the planet. Your customers will benefit from apps that respond faster and never go down. Windows Azure Cloud Services has software development kits (SDKs) for several languages and server side technologies including: .NET, Node.js, PHP, Python, Java, and Ruby. The SDKs include tools to help you prepare your application to run in the Windows Azure PaaS. Thank you for contacting us, we will be in touch with you shortly! Error:There was an error while submitting your form. Please try again later.